The Referee at the Majeski Stadium when the Millers travel there on Saturday is Jeremy Simpson from Lancashire. This will be Jeremy’s fourth time in charge of a Millers game this season, the first being in August when Hull City were the visitors to the New York Stadium. Richard Wood put the hosts in front just after the quarter of an hour mark with Jackson Irvine equalising for City twelve minutes later. Fraizer Campbell put Hull in front just before half-time with Irvine scoring again two minutes into the second half. Jamie Proctor came off the bench to make it three-two and make it an interesting last fifteen minutes but the Millers couldn’t get anything from the game. Wood was booked for the hosts and Marcus Henriksen for Hull. He was also in the middle in October at Preston. Five minutes before half-time Tom Barkhuizen put the hosts in front with a Michael Smith goal on fifty-five minutes getting a point for the Millers. Jeremy was last in the middle for a Millers game on Boxing Day at the Macron Stadium which saw Bolton win two-one. Sammy Ameobi scored for the hosts on the thirty-third minute with Will Vaulks equalising for the Millers four minutes later. A sixty-five minute Gary O’Neil goal gave Wanderers all three points. 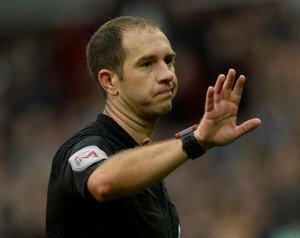 In the thirty games that Jeremy has been in charge of this season he has shown one hundred and eighteen yellow cards and five red cards. Running the line on Saturday we have Nigel Lugg and Adam Matthew while Peter Wright will be the Fourth Official.